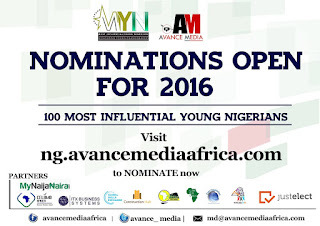 Africa's leading Media and Public Relations firm, Avance Media has in partnership with various local organisations launched one of the most comprehensive rankings for young Nigerians dubbed: 100 Most Influential Young Nigerians. The initiative which carries the vision to become the Leading and Most Credible program to Rank and Honour Young people in Nigeria and beyond will see various young people in industries being recognised for what they have done to contribute to the economy and development of Nigeria. 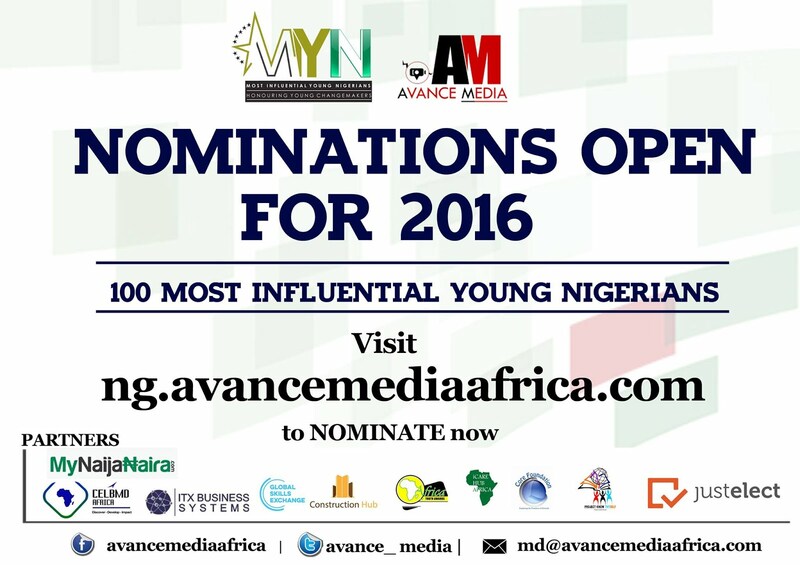 Nominees can be submitted on ng.avancemediaafrica.com and will be screen by a board of jury from Nigeria and the 100 finalists will be announced for a voting process to determine who the overall Most Influential Young Nigerian would be. Categories opened for nomination include Business, Entertainment, Law & Governance, Lifestyle, Media, Personal Development & Academia, Science & Technology, Leadership & Civil Society, Social Enterprise & Philanthropy and Sports. Public nominations will be closed on 25th November 2016 pending the announcement of the finalists in December. Avance Media is also replicating the same ranking in Kenya, Ghana, Cameroon and South Africa as they partner with various organisations to honour young people across the continent and nominations can be submitted on ke.avancemediaafrica.com, gh.avancemediaafrica.com, cm.avancemediaafrica.com and sa.avancemediaafrica.com respectively for those countries. The program has drawn partnership with Jagari Designs, CELMBD, My Naija Naira, ITX Business Systems, JustElect, Construction Hub Ltd, Africa Youth Awards, Dream Ambassadors Foundation GH, iCare Hub Africa, Global Skills Exchange, Core Foundation and Project Know Thyself International to execute this project across Africa. This initiative is meant to serve as a source of inspiration to young people around the world as annually, 100 & 50 young people will be selected as the most influential young people affecting decision-making in their respective countries. More information can be accessed on through www.avancemediaafrica.com, md@avancemediaafrica.com & avancemedia1@gmail.com.